With its pearlescent shine, pearl dots are the perfect finishing touch to your crafty creations. They are also a great embellishment alternative to adhesive gems and pearls. 1. Cut a 15 cm square of paper to cover your 6 x 6 card blank. We have layered the card with an 8cm strip of contrasting patterned paper to the centre to give a focal point, stick using double sided tape. 2. For our card focal point, we used a large & small wooden butterfly to create depth. Using the pearl dot bottles, shade the butterflies. The fine nozzle will make it easier for you to apply the colour, starting from the edge and then filling into the middle of the wooden shape. Once they have both dried, stick the larger butterfly using glue to the card and add the smaller butterfly on top. 3. On a piece of white card stamp the Happy Birthday sentiment, once dry, cut it out and stick to the centre of the card using foam squares. 4. As a finishing touch, we then added a row of three pearl effect dots at the top and bottom of the card. 1. To create a border to your card layout, cut a 14.5 cm square of paper and stick to the card blank. 2. Cut a 10cm square of the flower paper and add to the centre of the card using double sided tape. 3. To decorate your card, use the pearl pens to add colour to the middle of the flowers. With lots of pretty colours to pick from including silver, pink, red and yellow, there is no excuse not to make your card bright and colourful. Leave to dry. 4. Stamp the butterfly and Happy Birthday stamps onto card, cut out and stick in the centre of the card. Using this quick and simply design, you can swap your stamps to suit any occasion. 1. To create the stain glass effect on the balloons, add lots of different colour pearl dots closely together onto a piece of card and place another piece of card on the top to squash the colours and mix them together. Remove quickly and leave to dry. Once dry, print the air balloon stamp onto the pearl pattern and cut out the image. 2. Cut a 14.5cm square piece of backing paper and distress the edge. Layer the distressed paper with a 14cm square of floral distressed paper and stick to the card blank. 3. Cut a 7 x 13.5cm strip of your new print paper, again distressing the edges and sticking to the left hand side of the card. 4. Cut an 11.5 cm square piece of backing paper, distress the edge, mat and then layer with an 11cm square piece of Dovecraft Bloom and Grow cloud backing paper. Place the paper on the card at an angle and stick with double sided tape. 5. 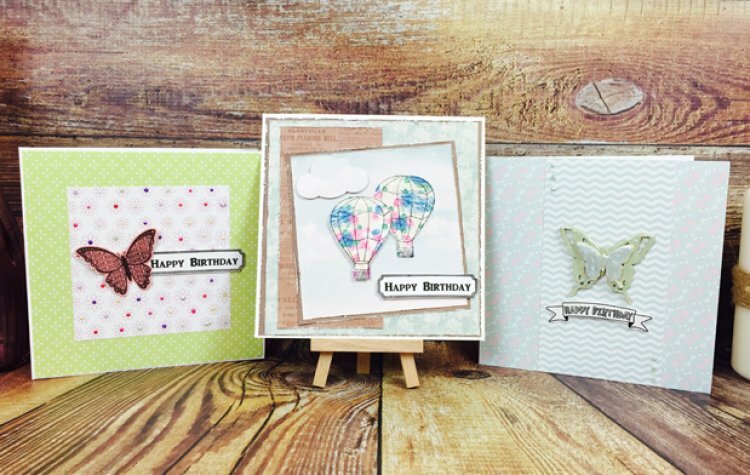 Add your hot air balloons to the front of your card; we have used foam pads to one of the balloons to create more depth. 6. Using the cloud punch, stamp a piece of cloud paper and add to your card using foam pads. 7. To finish, print your sentiment stamp on a separate piece of card and stick to your card once dry. The stained glass effect adds a lovely texture to your project. What is your favourite way to use pearl effect dots for crafting? Leave us a comment below and share your project featuring them in our gallery.